Bibliography: Bartsch 28; Joseph Meder 28b no burr, fewer scratches, not glossy ink of early impressions; Campbell Dodgson 10; P. 135; Ellen G. D’Oench, Prodigal Son Narratives 1480–1980 (New Haven and Middletown, CT: Yale University Art Gallery and Davison Art Center, Wesleyan University, 1995), cat. no. 2, pp. 4–7. 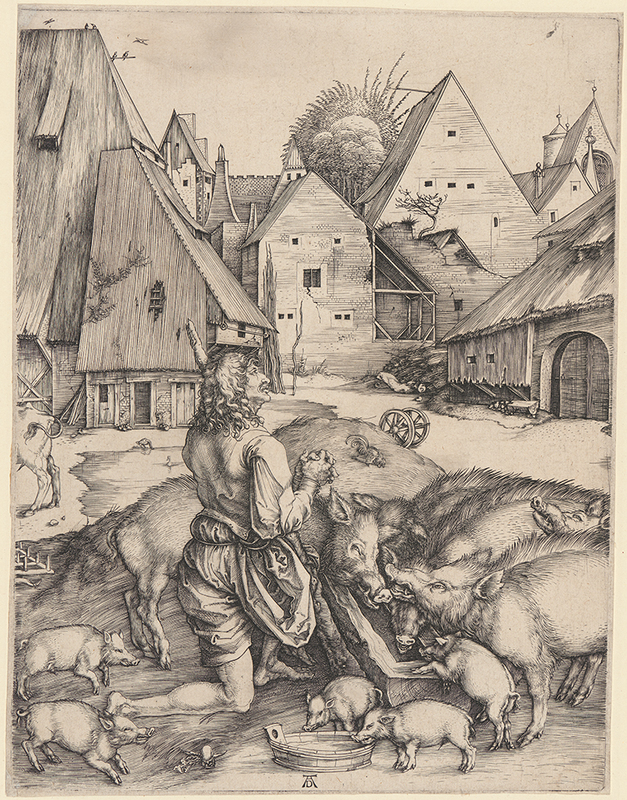 The Prodigal Son amid the Swine, . Engraving on laid paper. Plate: 248 x 189 mm (9.8 x 7.4 in.). DAC accession number 1938.D1.13. Gift of George W. Davison (B.A. Wesleyan 1892), 1938. Open Access Image from the Davison Art Center, Wesleyan University (photo: R. Lee). http://dac-collection.wesleyan.edu/obj5105 is a persistent link to this page with no user-session information.